Visual artist Lorna Simpson, poet Robin Coste Lewis, and architects Mitch McEwen, Imani Day, and Mario Gooden will come to Pittsburgh for an interdisciplinary arts symposium, including a community workshop, a presentation, and a reading, lecture, and moderated discussion focused on contemporary Black arts. All events are free and open to the public. Thanks to support from The Heinz Endowments, the Year of Diversity at the University of Pittsburgh, and the Charles Crow Fund, and thanks to our community partner City of Asylum. Architect Mitch McEwen will lead a community workshop called "This is What We Will Build When We Get Our Reparations." Using a laptop, projector, laser printer, pieces of foam, exacto blades, old magazines, glue, paper, and scissors, McEwen will guide participants through a design charrette. The term “charrette” means “cart” in French and goes back to 19th century design schools in Paris, wheeling design work from frantic student teams to be presented at finals. This design exercise will be swift and visionary and local, honing in on sites in Pittsburgh that could be developed with resources of reparations long (over)due to the descendants of enslaved Africans in the USA. 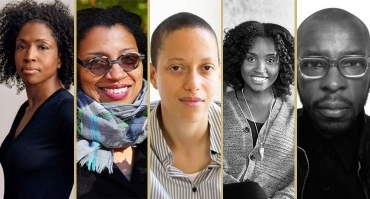 Architects McEwen, Imani Day, and Mario Gooden will present their "speculative design propositions" in response to poet Robin Coste Lewis' Voyage of the Sable Venus. Lewis will join the architects for a Q&A. Lorna Simpson and Robin Coste Lewis: "Why Black Art Matters"
Visual Artist Lorna Simpson will give a short lecture on her art and the topic "Why Black Art Matters Now." Poet Robin Coste Lewis will read from Voyage of the Sable Venus, and Simpson and Lewis will participate in a moderated discussion.